A brouhaha erupted recently in Israel over a completely theoretical question: could Israelis now living in the West Bank* be allowed to live under Palestinian rule? This debate usefully focused attention on one of the trickiest and deepest issues of the Arab-Israeli conflict, and so it bears pondering. 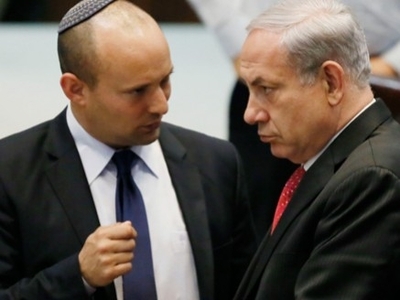 Naftali Bennett (l) and Binyamin Netanyahu, allies who sometimes strongly disagree. Israel's Prime Minister Binyamin Netanyahu started things off on Jan. 24: "I do not intend to remove a single [Jewish] settlement [on the West Bank]. I do not intend to displace a single [Jewish] Israeli." Glossing this statement, an unnamed official in the prime minister's office (PMO) explained that, "Just as Israel has an Arab minority, the prime minister doesn't see why Palestine can't have a Jewish minority. The Jews living on their side should have a choice whether they want to stay or not." That aide characterized this as Netanyahu's "long-standing" position. Some in the nationalist camp became enraged. Habayit Hayehudi chairman Naftali Bennett, a minister in the current government, blasted the prime minister for reflecting "an irrationality of values" and "ethical insanity." In his view, Zionists "did not return to the land of Israel after two thousand years of longing to live under the government of Mahmoud Abbas. Whoever advocates for the idea of Jewish life in Israel under Palestinian rule is undermining our ability to sit in Tel Aviv." Others agreed: "We will not abandon settlers behind enemy lines," said Deputy Defense Minister Danny Danon. Such ideas "contravene the Zionist ethos" observed Deputy Foreign Minister Ze'ev Elkin. "Ludicrous" was the choice adjective of Deputy Minister in the Prime Minister's Office Ofir Akunis. 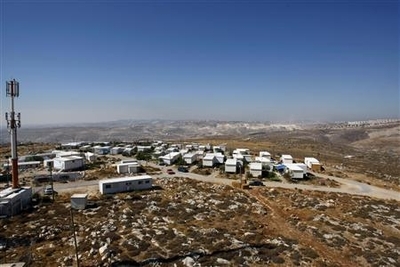 Migron, a West Bank outpost that the Israeli government helped fund and then evacuated. When another unidentified PMO official suggested that members of the government can leave the government if they disagree with the prime minister, Bennett ratcheted up, recalling murders of Jews by Palestinians and concluding that "The essence of Zionism is sovereignty. If there is no sovereignty there is no Zionism." The PMO then retorted with a demand that Bennett apologize or resign, to which he replied that "if the prime minister was offended, this was not my intention" while claiming the right to "criticize him when the situation calls for it. This is my duty." The incident ended with the surfacing of old interviews showing that Netanyahu and Bennett's party had each previously articulated the other's view, leaving things a complete muddle. What to make of this week-long debate? Who's right, who's wrong? Although I usually support Bennett et al. 's approach, Netanyahu is right this time, for many reasons. The disgrace, trauma, and futility of then-Prime Minister Ariel Sharon's removal of 8,000 Israelis from Gaza in 2005 – a move unprecedented for any democracy – points to the imperative for Israel's government to establish the inviolable principle that it never again will remove its nationals from territory. The Gaza experience also established how exponentially more disastrous it would be to repeat this process with the West Bank's 40 times' larger population of Israelis. That Netanyahu strongly objected to Sharon's decision (and left his government in protest against it) highlights his honorable consistency here. Second, why should the government of Israel fulfill the Palestinians' wish for a Judenrein West Bank? Third, permitting Jews to live under the Palestinian Authority is eminently practical. The Israeli flag cannot follow each Jew and make him an island of Zionist sovereignty. Plenty of Jews around the world and even some in the Middle East live outside of Israel's borders. Why not in the West Bank? Jews in Hebron currently need a great deal of security. 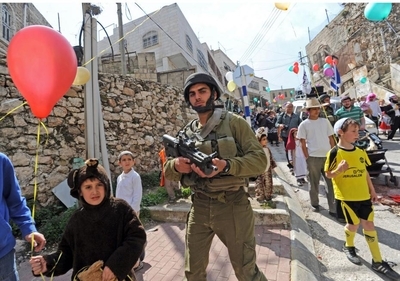 Here, a soldier guarding a Purim parade in 2012. Fourth, the PMO statement cleverly shreds the campaign of delegitimization against Jews residing in the West Bank. If Jews can live on the West Bank under Palestinian rule, they no longer can be portrayed as obstructing a resolution of the Arab-Israeli conflict, thereby defanging the whole "settlement" issue. Finally, this Netanyahu's position changes the terms of debate. It permits Jerusalem to argue that true resolution of the conflict requires Jewish Israelis being able to reside peaceably in a Palestinian state. The conflict will only truly end, I have contended for over a decade, "when the Jews living in Hebron need as little security as the Arabs living in Nazareth." Such a prospect, of course, is very remote; but accepting the principle of Jews living in "Palestine" allows Zionists to accept the two-state solution in the abstract while justifiably delaying its implementation for generations, maybe forever. Bennett and his supporters should calm down and appreciate Netanyahu's diplomatic master stroke. * Several readers asked why I use the term West Bank here rather than Judea and Samaria. For my reply, please click here. Feb. 20, 2014 update: John Kerry apparently agrees with this approach. Israel Hayom reports that "Israeli settlers might not be required to leave their homes as part of an Israeli-Palestinian peace agreement, U.S. Secretary of State John Kerry said in an interview with Israel's Channel 2" to be aired in full today. June 6, 2014 update: The second half of Netanyahu's view on the West Bank is apparently spelled out today by Martin Sherman in "Is Israel planning a unilateral withdrawal in the West Bank?" where he draws on a report by Ze'ev Kam in Makor Rishon. Netanyahu, Sherman notes, has recently indicated a willingness to consider unilateral steps in the wake of the failed diplomacy with the Palestinian Authority and his statement came in the context of a question from the parliament's Foreign Affairs and Defense Committee about his government's intentions after the breakdown in negotiations. I don't want one state from the Jordan to the Sea. Even if the demographic balance doesn't change to our detriment and there is a Jewish majority, it is still obvious that we need to have a Jewish majority that is overwhelming and for that state to be democratic. And that is why we need to come to a separation. … That way, we would be ensured of a Jewish majority and we would also have some wiggle room with some of the Arab countries for a certain period of time. This appears to be the first time Netanyahu has used the word "separation" with regard to the West Bank.